Chunk is quite into his crafts at the moment and whilst the weather is still quite rubbish on some days (today's rain is a prime example!) I have been entertaining him through things like play dough, paints and plasticine. 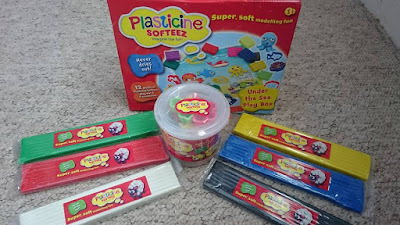 He was lucky enough this week to get the chance to test out some of the new Plasticine range from Flair Plc including the Softeez Tub of Fun and the Under the Sea Playbox. The Tub of Fun came with 5 sticks of Plasticine and two shape cutters in a handy little carry tub. The playbox included 12 different coloured Plasticines, sea-themed cutters and an under water themed play mat. The Plasticine never dries out unlike some of the play doughs we have wasted money on that have lasted only a few days. This means I don't get the nasty surprise of opening the tub and finding it crumbled to bits after promising Chunk an afternoon of fake 'cake making'. Chunk loved the playbox as spent hours making fish, sea snakes and octopus for the play mat. It was so cute watching him make up little Octonaut-style stories up with the models he made and I also attempted to make a boat and fisherman to add to his story. The small carry tub is brilliant for taking out when I need to occupy him during boring things such as my health appointments or if we are travelling long distance, and it doesn't stick to the car seats or carpets like other products do so much less work for me! 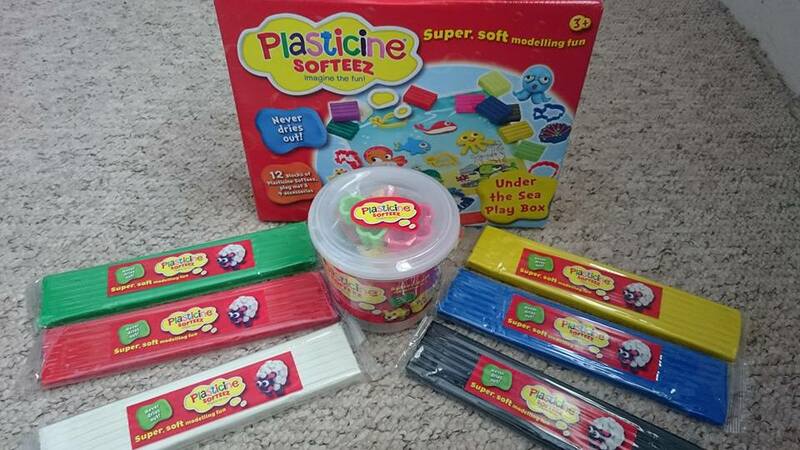 To find out more about the new range Plasticine can be found on Facebook, Twitter or Instagram. This looks fab and with the bonus of not drying out!